Somax has been working with runners since 1970, when the running boom started. Most of our early clients were runners who complained of tight hamstrings. We were able to improve their hamstring flexibility far beyond what they were able to achieve with stretching with our Microfiber Reduction program. Much to our surprise, a number of these runners reported knocking a minute per mile off their running pace on their daily five-mile run. When we expressed our disbelief, they assured us that they were capable of timing their daily run. Whereas it might have taken them 40 minutes before, it now only took 35 minutes. If it took them 35 minutes, it now took only 30 minutes. This was accomplished in just a few weeks. Puzzled by this unexpected improvement in running times, we consulted with a top local coach. Since we were not improving strength or endurance, we expected there must be some improvement in efficiency for our runners to drop so much time with no additional effort. He said that he knew of two factors in running mechanics: stride length and turn-over. We thought that there must be more to running than that since there were so many variations in running. He provided us with a textbook on running biomechanics, which said essentially the same thing. We decided to investigate running mechanics ourselves. Since we were improving flexibility in runners, we started by measuring their range of motion while running to see what, if any, differences there were in our runners before and after their Somax program. This was not easy, as we were using an 8mm film camera at the time. But it was how we discovered the importance of the Stride Angle, the maximum opening between the front and trailing legs, usually at toe-off. The bigger the improvement in Stride Angle, the more time the runner cut of his daily runs. Once we realized the importance of the Stride Angle to performance, it was easy to then release microfibers that were restricting the Stride Angle, as well as improving hamstring flexibility in runners. As a result, all of our runners cut a minute per mile or more off their running pace. An added benefit from increasing the Stride Angle was that our runners spontaneously reduced their overstride. This reduced the stress on their knees, and for many of them eliminated anterior knee pain. Our next big discovery was Upper Body Torque, or twisting in the upper body caused by stiffness in the shoulders. A runner came to us with chronic pain in his left knee. Viewing his stride on video from the side did not show any differences between the right and left sides. We also did not find any physical differences between his two legs. So for the first time, we videotaped him running from the front. We measured what we could, which was the number of degrees his legs crossed over toward the midline as he ran. Here we saw a significant difference between his right and left legs. His right leg crossed over 2 degrees, but his left leg crossed over 7 degrees. Since we felt this could be contributing to his left knee pain, we took him to the track and had him run while keeping his feet from crossing over the line on the track. To our surprise, he was only able to do this for a couple of strides, when he reverted to crossing over as before. We spent many hours reviewing his video before we noticed that his right arm crossed over more across his chest than his left arm. As we stood on one leg, moving the other leg and our arms back and forth as if running, we noticed that when we pulled our right arm across our chest, our left leg crossed over toward the midline. We thought we had discovered the cause of his crossover. So we went to the track again on his next visit and asked him to run with both arms moving straight forward and back. He again was only able to do this for a few strides and then reverted to his old pattern. At this point we decided to examine his arms and shoulders for any physical differences. We discovered that his left arm had much less extension than his right arm. We guessed that pulling back his left arm twisted his shoulders to his left, threw his right arm across his chest, and then he crossed his left leg over to the right to compensate for this Upper Body Torque. If he did not swing his left leg to his right to compensate for the torque in his upper body, then he would have taken off to his left and not been able to run on a straight line. Skiers will recognize this problem, as they know when they turn their shoulders, it causes their skis to turn. We felt around his left shoulder area and discovered a small bump on his left collar bone. We asked him when he had broken his collar bone. He replied it happened when he was 8 years old, but did not understand what this had to do with his left knee pain. We explained that microfibers had formed around the muscles of the left shoulder to immobilize the area so that the bone could heal. Unfortunately, after it healed, the microfibers not only did not go away, they continued to accumulate over time, making his shoulder stiffer with age. We released the microfibers in his left shoulder, and had him run again. The videotape showed that he no longer twisted in his upper body, his right arm no longer came across his chest, and his crossover on his left side dropped from 7 degrees to just 3 degrees. All this happened with no thought on his part to run differently than before. He returned home and reported that his left knee pain disappeared. This confirmed to us again that most stride problems were the result of microfibers restricting movement within the body, and not the result of mental errors, which is why trying to teach a runner to be more efficient is usually fruitless and often results in injury to the runner. Over the next fifteen years, Somax videotaped and analyzed more than 4,500 runners. We were able, in a short period of time, to show each runner how their injury and performance problems were a result of their stride mechanics. For instance, runners with a lot of overstride often had chrondomalacia, or softening and pain under the knee cap. Runners who bounced up and down a lot often had stress fractures in the pelvis. Runners with toe lift had shin splints. Runners with more than 2-3 degrees of crossover had chronic running injuries to their feet, knees and hips. A quick check of their flexibility in running specific ranges revealed the cause of these problems. Runners who ran out of breath during a race always had lack of flexibility in their chest, diaphragm and abdomen. Runners with overstride always had a small stride angle as a result of stiffness in their hips. After completing all these analyses and working with hundreds of runners in our Microfiber Reduction program, we started to write articles on running mechanics for The Runner, The New York Times, etc.. We also served as on-air stride analyst for numerous marathon and road race broadcasts. We presented papers at scientific and coaches conferences on running. Our work was mostly received with indifference as everyone in the running and scientific communities was convinced that the only way to improve performance was by increasing fitness or strength. In 1988 we were invited by the head track and field coach for the American team to videotape and analyze the runners at the 1988 Olympic Trials in Indianapolis. We videotaped the top four finishers in every race, male and female, from the 1500 to the 10,000. In every race, without one exception, we found that the runners finished 1st, 2nd, 3rd and 4th in order of their Stride Angle. Often the difference between 4th and 3rd place, which was the difference between going to Seoul or staying home, was just one degree. We sent photos of these results back to the coach and suggested we work with all the runners on the team to increase their Stride Angle. He never responded. In 1992, Bob Prichard, president of Somax, was hired as on-air analyst by NBC Sports for the 1992 Barcelona Olympic Marathon. He analyzed and measured the bounce, stride angle, overstride angle and crossover angle of the American and lead runners. At the halfway point he predicted the winner of the race as he was the most efficient runner in the lead pack. More importantly, Mr. Prichard discovered a rare videotape in the NBC Library in Barcelona of the 1988 Rotterdam Marathon, where Belayneh Densamo set a new World Record of 2:06.50, a mark that lasted 10 years. Mr. Prichard as curious to see this video because of a comment made by Densamo at the end of the race that he felt 'like he could run another 5 miles'. To his amazement, Mr. Prichard found that Densamo had bounced up and down only 1/2" during the marathon. Since most elite runners bounce up and down 3", Densamo had completed the marathon doing only 1/6th of the work done by other runners. No wonder he felt like he could run another 5 miles. We realized at that point that a marathon could be completed in under two hours by reducing bounce, overstride and crossover and increasing the stride angle. Runners take about 1,000 strides per mile, or 26,200 strides during the marathon. When you multiply 3" X 26,200, you get 6,550 vertical feet, or 1.24 vertical miles. This is equivalent to half-way up Mount Kenya, one-third the way up Mount Fuji, for four former World Trade Center buildings in New York. It is this vertical distance that makes the marathon difficult--not the horizontal distance. Somax can eliminate that mountain with its four-week Elite Runner Program. While our recreational runners usually cut a minute per mile off their running pace, elite runners can expect to cut 30 seconds off their race pace. This means that any marathoner who can run 2:12 or better can expect to go under 2 hours with improved efficiency. In other words, if you are fit enough to go under 2:12, you are fit enough to go under 2 hours. A runner with a 3 inch bounce lands with six times his body weight on each leg. For a 150 lb. runner, this is 900 lbs. Since a runner takes 1,000 strides per mile, this adds up to a total of 450,000 lbs. on each leg per mile. During a marathon, it totals 11,790,000 lbs. on each leg. When a runner crosses over toward the midline or overstrides, the muscles of the hips and upper leg have to hyper-contract to stabilize the leg and knee. Then, while they are still contracted, they are stretched as the runner continues forward. This forced stretching while contracted tears many of the tens of thousands of individual fibers that make up each muscle. This is what makes the muscles sore from running. Part of the healing process is the creation of microfibers (mild scar tissue) in and around the muscles. These microfibers not only do not go away after the muscles have recovered, they actually accumulate over time, making the runner stiffer with age. This age-related stiffness is why so many runners have such short careers. As the runner becomes stiffer, their Stride Angle decreases. As a result, they cover less ground with each stride, which slows them down-- despite having better strength and fitness. Since these microfibers are scar tissue, they cannot be released by stretching. But they can be released with Microfiber Reduction, our special program to improve flexibility in athletes far beyond what stretching alone can do. Once the microfibers are released, many of the stride faults will be automatically resolved without the runner even thinking about them. Those that remain can easily be corrected with our special drills and videotape feedback. Distance runners are not the only athletes to benefit from Somax running program. Baseball players see a remarkable improvement in their base speed. One high school shortstop increased his stolen bases from 14 for 15 attempts to 32 for 33. A pro ball player improved his ratio of bases stolen/caught stealing from 18/9 to 10/1 in the same season--a 500% improvement. 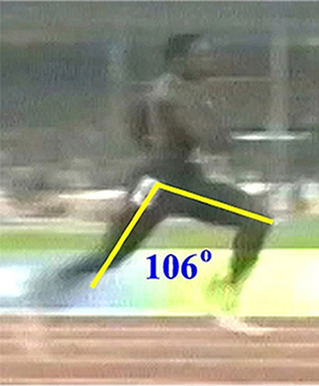 Sprinters can also benefit from an increased Stride Angle, as can be seen in these photos of Usain Bolt winning the 100m compared to his #2 rival. 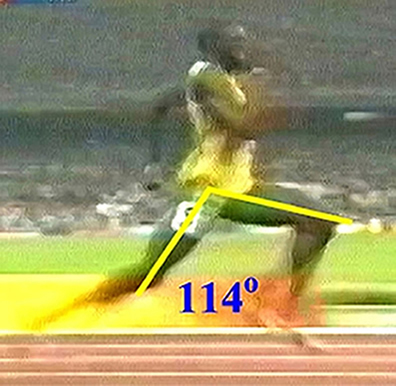 It is assumed that Bolt is fast because of his leg length, but his bigger Stride Angle is the real reason behind his success. Since we have found that a runner increases their stride length 2% for each degree that they increase their Stride Angle, Bolt is covering at least 16% more ground with each stride than his opponent. It is very difficult to keep up with someone who is covering more ground than you with each stride. Here is one of our runners before and after his Somax program. He cut 8% off his hurdles time. Soccer players run the equivalent of 10,000 meters or 6.2 miles during a game. Unlike runners, their opponents try to take out their legs by kicking and tackling them. They also elbow them in the arms, ribs and face. One such player was Preki, the premier midfielder in American professional soccer for many years. Preki often led the fouls suffered list each year. Twenty years of this kind of punishment took their toll on his body. He developed so many microfibers that he slowed down on the field at age 36. His coach threatened to play him from the bench. This is when he decided to work with Somax. The results were phenomenal. As you can see, Preki increased his Stride Angle from 85 to 105 degrees, a 20-degree increase. This means he was able to cover 40% more ground with each stride, making it almost impossible for opposing players to keep up with him, or get away from him when they had the ball. As with most runners who increase their Stride Angle with Microfiber Reduction, Preki spontaneously reduced his overstride, which reduced the grinding on his knee caps. Microfiber Reduction also reduced his crossover angle on his left leg from 16 degrees to 6 degrees. His right leg improved from 12 degrees to 5 degrees. The result was that Preki reported that his legs felt fresher toward the end of the game, and he recovered faster. In addition, we improved Preki's chest expansion from just 1/2 inch to 5 inches--a ten-fold increase. The feeling of getting winded disappeared as Preki effortlessly drew in more oxygen with each and every breath. The upshot of his four-week program is that Preki was played as a starter in 31 of 32 games that season and led his team to the National Championship. This is not our opinion, but the opinion of his teammates who explained at half-time to ABC that their game plan to win the national championship was 'to get the ball to Preki'. As with all Somax programs, the results for Preki were long-lasting. Four years later, at age 40, he was voted League MVP. Coaches and runners alike overlook the contribution of flexibility to endurance. They never bother to measure the expansion of the chest, diaphragm or abdomen, so they don't realize how restricted these ranges are in runners. A 38 inch chest in a runner without microfibers will expand a minimum of 6 inches. We have measured chests in non-runners that expand as much as 9 inches. As with Preki, most runners expand less than 2 inches--some much less. This tightness in the chest, diaphragm and abdomen greatly increases the amount of effort a runner must expend to take in oxygen during competition or training. It also greatly reduces the amount of oxygen that the athlete can take in. One of our clients, for instance, increased his vital capacity by one full liter after we released microfibers in his chest. When the chest, diaphragm and abdomen are tight, the thin diaphragm muscle has to contract harder to pull in air. This fatigues the diaphragm. If the diaphragm gets too fatigued, it is liable to fail. To prevent this potentially catastrophic event, the brain will shut down the muscles of the legs and arms to reduce the demand on the diaphragm. Thus, many runners never get to use the fitness that they have trained so hard for, as their body shuts down prematurely because of restricted breathing. Our brain actually uses four times more oxygen than our muscles. So the first part of our body to suffer from restricted breathing is the brain. Tightness in the chest, diaphragm and abdomen leads to shallow breathing 24 hours a day. Since we take 17,000 breaths per day, this can lead to an oxygen deficit for the brain. Because the brain runs on just oxygen and sugar, and restriction in either one causes fuzzy thinking. We recognize this when we have not eaten for many hours--our thinking is fuzzy. But the same thing happens when we have shallow, restricted breathing. The only way to tell if shallow breathing is affecting your brain is to go for a run. Running will force you to breathe more deeply and send more oxygen to your brain. If you think more clearly during and after your run, your brain is not getting enough oxygen 24/7. This lack of oxygen 24/7 leads to poor thinking in athletes. It is the major reason they find themselves making bad decisions both in and out of competition. Increasing breathing ranges also improves mood. Psychological tests conducted with our athletes before and after their Somax program showed a remarkable reduction in hostility and depression and a corresponding improvement in self image. Athletes who run have experienced a stunning increase in income as a result of their Somax program. One professional baseball player increased his income in one year from $500,000 to $1,750,00 as we increased his bat and base speed by releasing microfibers that were restricting his movement. A prominent basketball player got a $5,500,000 contract extension because he improved so much from his Somax program. Whether you run on the track or road, or play baseball, football, basketball, soccer, rugby, or tennis, you can improve your speed and performance and extend your career far beyond conventional coaching or training with our Elite Runner Program. The program starts with a minimum of four weeks of Microfiber Reduction, along with daily videotape analysis of your mechanics and flexibility. It will also include our Stress Reduction and Tension Reduction programs, stretching and strength training, and our special drills. This initial four-week program will be sufficient to get rid of many of the microfibers you have accumulated during your career. But the demands of professional competition are so great, that at least one week of additional Microfiber Reduction will be needed each year over the next four years, just to get rid of the microfibers generated by training and competition. In this way, you will be able to maintain an insuperable advantage over your peers, who are gradually getting stiffer and slower year by year. Fees for our Elite Runner Program can be found under Level V here. It has been almost half a century since Arthur Lydiard popularized over-training as a method to improve running times. Strength training is a 2,000 year-old technology. The modern world has little in common with the 1960's or 500 BC. It is time to move on. Over training tears many of the tens of thousands of small, individual fibers that make up each muscle. Weight lifting increases strength by tearing many of the tens of thousands of individual fibers that make up each muscle. As these fibers repair, they become bigger and stronger. But with both over-training and weight lifting come microfibers--a mild form of scar tissue that helps to repair the torn muscle fibers by immobilizing the area so that it can heal. These microfibers not only do not go away after the area has healed, they continue to accumulate over time, making the athlete stiffer with age. This is why athletes have such a short career. It's time to recognize that the human body can only take so much over-training and weight lifting, and that limit has been reached. It's also time to recognize the damage done to athletes with over-training and weightlifting. Athletes have been pushed to the breaking point because of the reliance on old technologies. Its time for a change. Somax is that change. By releasing the microfibers caused by over-training and weightlifting, and then improving efficiency, Somax athletes see their performance improve far beyond what these old technologies can do. As we say at Somax, you have to be fit and strong to compete, but you need to be efficient to win. For further information on our Elite Runner Program, please contact us.